As voted the most romantic restaurant in the world, there was no-where else Andrea wanted to take me for our 2nd year anniversary. 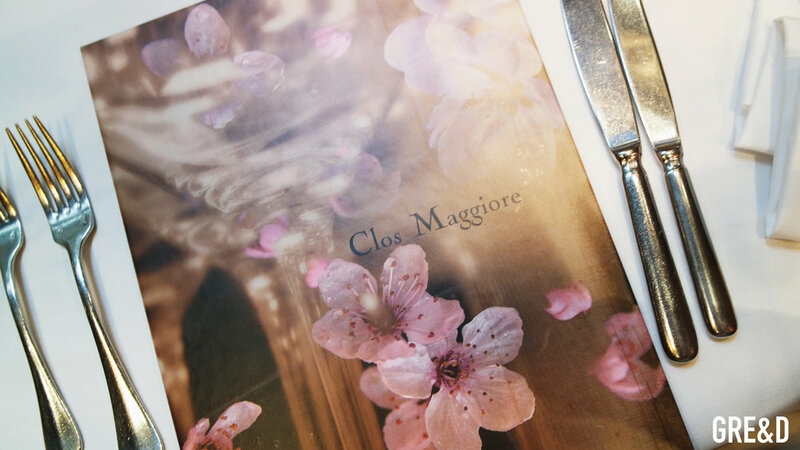 Countless times we both walked past Clos Maggiore and awed from the outside. It's small front, a haven inside. We looked at booking in the summer but after being told that it was fully booked until the mid autumn we thought we'd have to wait. Until Andrea managed to get a table for out anniversary. It was a complete surprise. 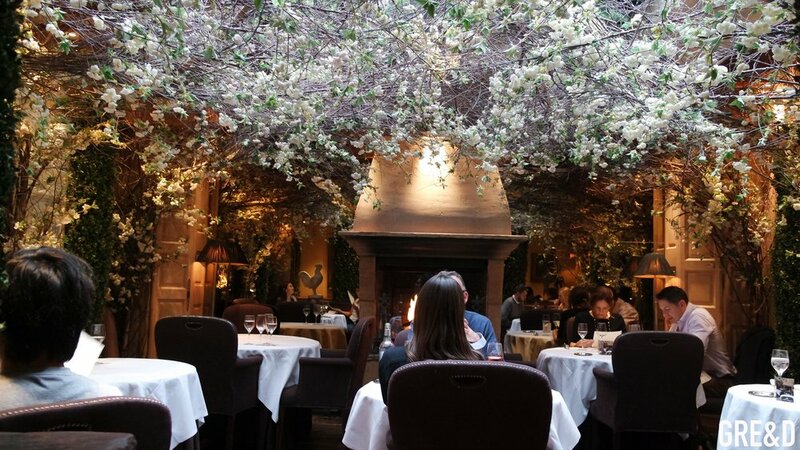 If you know anything about Clos Maggiore, you aren't guarented to sit in the conservatory (where all the blossom is) so we were expecting not to get the full experience. However when we arrived, we were sat in the back next to a roaring fire underneath the overflowing white flowers. We were greeted with french waiters who were very welcoming and were not hesitant when we had questions. 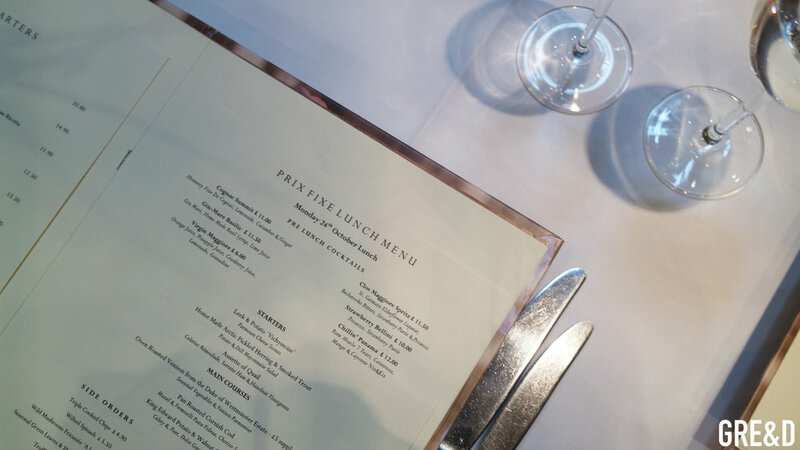 As always we decided on the lunch set menu which was three courses and half a bottle of wine each for £34.50. Being in the conservatory was like being in a dream. I didn't want to leave yet I had just sat down. For starters, Andrea and I both had the same (what a shocker) of Homemade Artic PickledHerring and Smoked Trout which came with a potato & dill salad. It was divine. The smoke trout had that real woody flavour to it and it was perfectly balanced out with the saltiness of the herring. The juxtaposition of the flavours made it really exciting to eat. Although it was small the flavours packed a punch. For mains, it was hard to choose between the fish dish and the gnocchi but I chose the gnocchi as Andrea was having the fish so it was a good excuse to try both! King Edward Potato & Walnut Gnocchi with celery, pear and a gorgonzola sauce was like eating little pillows of love. The gorgonzola sauce was quite buttery and with the poached pears it made it very sweet. Andrea said together the flavours tasted like custard! Tiny wild mushrooms were also in the dish and this brought back the earthy tones. The celery also was still left a little crunchy, giving it some great texture with the soft potato. Andrea had the Pan Roasted Cornish Cod with mussel & vermicelli pasta and chorizo sauce. It looked great; white fish in a red and orange sea. It was rich in flavour from the oozing chorizo and salty mussels. I'm not very adventurous with desserts as I like to end my meal on something that I know that i'll love and indulge in. I asked the waiter what flavours of ice-cream and sorbet they had, and as soon as he said coconut I stopped him. The coconut sorbet had pieces of coconut in it so it didn't have that smooth finish like most sorbets do but it was delicious. It also had a cinnamon crumb at the bottom - extra yum. Andrea had the creme brulee which came with vanilla pod ice-cream and two mini sponge cakes. I don't usually like creme brulee but it was so creamy I probably could have eaten it all. I can honestly say that Clos Maggiore is one of the most beautiful restaurants I have ever been in and probably will ever be in. The service was impeccable and I would eat here every day if I could. Our second year anniversary was extra special from the wonderful people at Clos Maggiore.